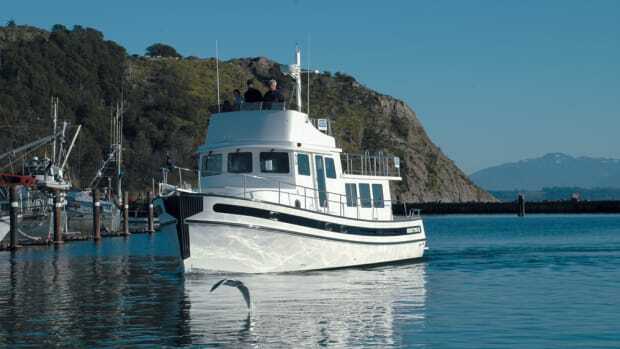 Few people in our niche are unfamiliar with the Krogen trawlers offered by Kadey-Krogen Yachts. Since the late 1970s, the company has continued to satisfy a growing fleet of owners with these capable, full-displacement trawler yachts. The eager, cultlike following of Krogen owners is more along the lines of a large family, as all agree the liveaboard comfort of these boats is their most endearing feature. The Krogen 42 remains the most popular of the Kadey-Krogen fleet, and some 206 Krogen 42s were launched. They can be found in the Pacific Northwest, in Alaska, along the Great Circle Route and the ICW, throughout the Bahamas, and all along the U.S. coastlines. The 42 is a supremely competent cruising boat that remains a sought-after classic. Although it is capable of offshore passages, few use it that way, as the lifestyle of its owners is more about low-stress gunkholing than crossing oceans. It is a realistic boat for realistic couples choosing to live on the water and enjoy the many pleasures of the waterways. As I&apos;ve commented before, the Krogen 42 looks happy, with its jaunty angled foredeck and bow, and most Krogen 42 owners agree that in addition to this happy disposition, the boat has classic lines and provides loads of usable volume for a 42-foot boat. Unfortunately, the Krogen 42 got too expensive to build towards the end of its run, as there were just too many molds required to build the boat. The cost of retooling was not a viable option, so production of the boat ceased in the late 1990s. In the years since, the Kadey-Krogen line expanded with a new model introduced about every 3 years. Today the company sells a 39, several variations of a 48, and a 58. All share the capability and comfort that are core elements of Kadey- Krogen Yachts. The Krogen 39 was the company&apos;s first step in significantly raising the quality levels in the Kadey- Krogen fleet, using higher-quality equipment, products and construction techniques. From gelcoat to tank material, the focus of the company is to take production quality to a higher level in all areas. And this effort has been successful. Compare any of today&apos;s Krogens with an early model Krogen 42, and you&apos;ll see many differences behind that classic, happy profile. Several years ago, Kurt Krogen, president of Kadey-Krogen Yachts, recognized that the company needed to build or reintroduce a boat to replace the Krogen 42, but he knew that simply building a newer Krogen 42 did not make much sense. After getting lots of input from focus groups made up of owners with extensive experience on the original, the company determined that a new 42 would not be different enough from the Krogen 39. Many thought, though, that a slightly larger boat would allow for a bigger cockpit and permit a fixed helm chair in the pilothouse, two features that were identified by Krogen 42 owners over the years as wish-list items. With all of the above in mind, the design team- Kurt Krogen; his marine designer brother, Jimmy Krogen; and the folks at Bristol Harbor Design Group-went to work. The result is the Krogen 44, a yacht that fits squarely between the 39 and 48. While it may initially appear that the new 44 is just a new version of the 42, the new Krogen 44 actually shares very little with its older sistership. In fact, it is much closer in many ways to the Krogen 58, Kadey-Krogen&apos;s flagship, and constitutes a serious statement of the company&apos;s vision of superior quality and craftsmanship. In fact, Kurt Krogen waited to produce this yacht until production quality met his satisfaction. "We wanted to make the quality changes first, then address production and support for our boats and owners," Kurt told me during my recent visit to Kadey-Krogen Yachts in Stuart, Florida. "We needed to totally revamp our production methodologies to raise the quality of the end product. We understand the need for improving our quality, rather than finding ways to simply increase volume." To say he succeeded is an understatement. The differences between the venerable Krogen 42 and the new 44 are so vast that it is difficult to compare them, beyond a similar profile. Every area of the boat reflects improvement. While most of the refinements are in equipment, construction materials and advanced boatbuilding technology, other changes were made in the design because they made sense. And according to Larry Polster, vice president of Kadey-Krogen Yachts, the Krogen 44 is built from only three molds, to simplify construction and to eliminate seams and potential leaks. In all, the effort took 3 years to create, from Kurt&apos;s initial conceptual design to the launch of the first Krogen 44, Number One, owned by Mike Ford, who also owned the first Krogen 39. The new boat is faster, has more range and is a more integrated structure due to the complex but superior tooling. I could list several pages of changes, but highlighting a few will give you an idea of what I&apos;m talking about. The teak decks on the Krogen 42, much like all boats of that era, were screwed down and the holes bunged and sanded. Over time, these decks would wear, and leaks would develop. Many trawlers have had their decks refastened and repaired due to this building practice. Today&apos;s teak decks are glued down without mechanical fasteners, so they suffer none of the potential leak issues. This is definitely a case of technology advancing a better, higher-quality product. Instead of varnished-teak exterior doors that are relatively high maintenance, the new Krogen 44 features dogged, welded aluminum doors from Pacific Coast Marine. The difference is outstanding in every way, from improved weather protection to reduced need for maintenance. And those are just the obvious upgrades. Many are more subtle, or invisible. The anchor locker access from the master stateroom on the Krogen 42 has been replaced by a Kevlar-reinforced collision bulkhead with a watertight Freeman hatch on the foredeck for access into the chain locker. Kevlar is also used on the stem and stern to add a safety factor for real-world cruising. Another subtlety is the use of Awlgrip&apos;s Griptex for nonskid instead of the molded-in nonskid that so often isn&apos;t.
And the older boats were built as base boats. Once they shipped to this country from Taiwan, optional equipment-gensets, thrusters, stabilizers, air conditioning-was installed by the dealer. Today, everything is installed during initial construction at Asia Harbour Yachts in Taiwan. The resulting yacht is more integrated, more finished. Only marine electronics and the dinghy are left for installation stateside. Most of the above examples underscore a trend in the industry to sell a more complete, ready-to-go yacht. Complementing a successful overall design, the new Krogen 44 is indeed more than the sum of these quality parts. If the Krogen 42 represented the essence of the late Jim Krogen&apos;s vision of a great cruising boat, the new Krogen 44 is son Kurt Krogen&apos;s idea of a highquality, contemporary cruising yacht with the same Kadey-Krogen features that make them great liveaboards and good sea boats. One of the first things I noticed walking up to the boat is the trademark rubrail that runs from the stern forward past the pilothouse. The rubrail on the Krogen 44 extends almost 4 inches away from the hull and really protects the hull from pilings and fuel docks. Located 36 inches up from the waterline, it is ideally placed to handle a wide range of docking situations. It even works as a step. A 30-inch wide swim platform, complete with a 21-inch-wide transom door, is one access point to get aboard. But the boat also has port and starboard bulwark side doors, an even more convenient way to step aboard. With the side door open, the bottom of the step is right at the rubrail-again, 36 inches off the water. That is perfect for floating docks. For more extreme docking situations, such as Halifax Harbour in Nova Scotia at low tide, there is more access just outside the pilothouse doors, with a cast Kadey-Krogen scuff plate on the caprail, 66 inches off the water. Overall, these offer flexible and practical access, especially for older retired couples less agile than younger people, who don&apos;t mind the typical gymnastic acrobatics required on many boats. Once in the covered aft cockpit, the security of the protected cockpit is all encompassing. The perimeter bulwark ranges from 28 inches to over 36 inches high. Combined with the overhead covering of the boat deck, the cockpit is a marvelously protected living area from which to enjoy the world. The standard boat has teak decks in the cockpit and side decks, and the glued, 5/8-inch-thick decking should last a very long time. Headroom in the cockpit and covered side decks is a minimum of 6 feet 8 inches, and around most of the cockpit, it&apos;s considerably more. Other nice features are the raised double hawsepipe and cleats at the transom and amidships. When running springlines and stern lines when there is only one cleat, it is often necessary to put lines over top of one another. Having double cleats makes it possible to adjust one line without first having to remove the line over top. It is a very nice, cruising-friendly feature. he cockpit is almost 7 feet long and 13 feet wide and is one of the areas of the boat that benefits from the increased length of 2 feet. Owners expressed a desire for more area in the cockpit to expand its utility when living aboard. A large lazarette hatch is held open by two pneumatic struts to help in stowing bulky items, such as folding bicycles and scuba gear, and the lazarette is the size of a basement. Side decks are 19 inches wide down at your boat shoes, and there are sturdy stainless-steel handrails along the cabin side for moving forward safely at sea. Boat deck drains have been incorporated into the aft fashion plate, with the drain exiting at the waterline. This prevents the inevitable appearance of black streaks on shining gelcoat. Walking forward on the starboard side deck, I noted the two fuel fills for the fuel tanks, recessed into a spill tray to contain any overflow. This feature was introduced on the Krogen 58. Climbing three steps brings us to the foredeck, which is coated with Griptex nonskid for secure footing. The angle of the foredeck is less pronounced than on the Krogen 42, although I suspect only the experienced eye of a Krogen 42 owner would notice. With firm footing, walking to the bow is very safe, and there is a superbly crafted stainless-steel railing securely mounted on top of the varnished teak caprail, ranging in height from 31 to 37 inches. A 9-foot-long bench seat (with storage underneath) gives a ringside seat for crew and guests in protected waters-such as checking out the extreme estates that dot the ICW&apos;s more wealthy communities, along Lake Washington, on Grosse Point, or along Vancouver&apos;s picturesque waterfront. The forward shorepower outlets are in the center of the bench, which is 10 feet back from the bow. Kadey-Krogen is known for realistic and competent anchoring gear, with dual bow rollers set far enough apart to hold two different types of large anchors in a large, wide bow platform that is well able to support heavy ground tackle. A Maxwell 2200 windlass is standard, as is the chain stopper for the 300 feet of 3/8-inch anchor chain. As I mentioned, the watertight Freeman hatch provides access into the anchor locker forward of the Kevlar-reinforced collision bulkhead. The bow area on this boat is very shipshape. A ladder in the aft cockpit provides access to the boat deck and flybridge. While I&apos;m no fan of the vertical ladder, on some boats it&apos;s the only viable means of accessing the upper deck. The boat deck measures roughly 14 feet by 14 feet, an enormous footprint for a sizable dinghy, kayaks, and other cruising essentials. The mast and boom are made in the United States and fitted when the boat arrives at Kadey-Krogen. As a unit, they have a lifting capacity of 800 pounds. The flybridge includes a centerline helm chair and two settees outboard of the helm console. As the boat deck and flybridge come from one mold, the flybridge/boat deck is a clean structure with no joints and seams, a visible improvement in boat construction. Visibility forward is good over the bow from the flybridge, with some restricted sight lines of crew working the windlass or dealing with bow lines. But one would likely be operating the boat from the pilothouse in such situations, from which visibility of anyone on the foredeck is outstanding. A welded aluminum Pacific Coast Marine door separates the saloon from the aft cockpit. It is a large door, 76 inches tall and 32 inches wide, with dogs. I just loved the resounding clunk when I closed the door. It is the sound of quality. 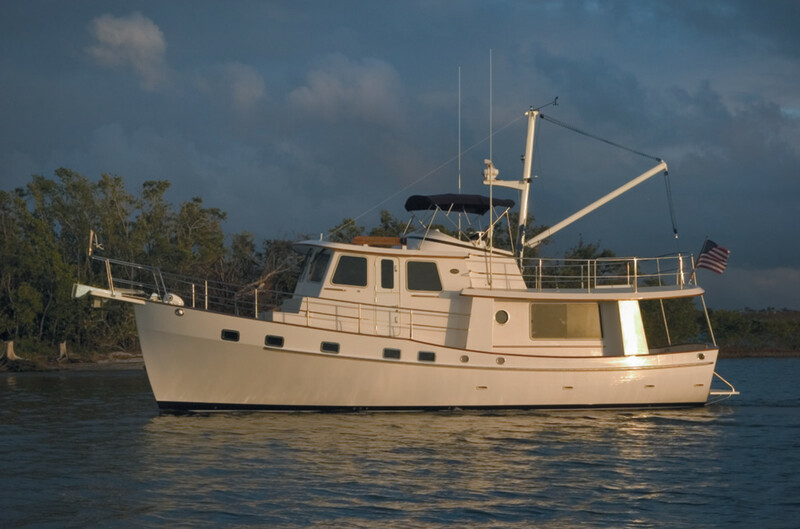 The Krogen 44 comes standard as a walk-around model, with side decks port and starboard. Kurt explained some interesting comparisons: As a walkaround model, the saloon is about the same size as that in a wide-body, the Krogen 42. The optional wide-body Krogen 44 uses the side deck space on the port side and the boat&apos;s beam increase of 8 inches to create the same saloon one finds on a walk-around Krogen 48. While I like the look and utility of the two side decks, I understand the liveaboard appeal of the wide-body layout. I suggest you spend time on both models to decide for yourself which would work better for you. The saloon of the walk-around model is about 8 feet long and 10 feet 8 inches wide. An L-shaped settee on the starboard side has storage underneath, and the long side of the settee measures 6 feet. Yanking out the corner seat-back cushion adds to the length, so even taller off-watch crew members can sleep when sea conditions drive them out of the forward living spaces. Large, screened windows that open really light up the saloon. All are Gebo, tempered-glass units. Headroom averages 6 feet 10 inches in the saloon and galley, and a teak handrail runs down the center of the saloon overhead. Not everyone will be able to reach it, but there are other choices for shorter crew. The sole is teak parquet. Across from the settee and its adjustable table is an open space that is perfect for a pair of freestanding Ekornes chairs. I&apos;m a big fan of U-shaped galleys. Without having to move around much, I can reach everything I need to cook a meal while tucked in a corner to work in a seaway. The downside, if any, is that cooking becomes a solo sport, as there generally isn&apos;t room for another unless both are engaged in static activities, such as peeling carrots. Somehow, the increased size of the Krogen 44 translates into a bigger galley, enough to make dueling spatulas a real possibility. Another thing I noticed is the opening port. On the Krogen 42, gazing out the galley&apos;s opening port gave a view right into the side fashion plate, making the port mostly useless except for ventilation purposes. Throwing scraps of food out the port to feed the fish resulted instead in a collection of garbage on the side deck. Kurt made sure this got fixed on the new boat. Now the 12-inch port allows you to look at the dolphins racing to dance in your bow wave. The galley measures 6 feet 6 inches long by 7 feet wide. The longest counter is a marvelous work space 7 feet long by 26 inches wide, with a single large sink slightly outboard of the middle, leaving a great food-prep area. A three-burner Force 10 propane stove and oven are on the outboard end of the U-shape, with more counter space on the forward end of the galley. A Tundra refrigerator/freezer completes the U shape. A set of louvered cabinets extends 16 inches down from the overhead to complement under-counter storage. Overall galley storage is excellent, and the overhead cabinets don&apos;t block the ability to remain engaged with crew in the saloon. Inboard of the galley footprint is the normal access hatch into the engine room, similar to those found on other Krogen trawlers. It is a large hatch with a short ladder down into the space (with teak steps, not those goofy round rungs that are painful on bare feet). Three other hatches in the saloon open for major access to all machinery in the engine room. Across from the galley on the port side is a set of shelves and lockers that any Krogen enthusiast will recognize instantly, with loads of readily accessible space for provisions, bottles, books, and other stuff. This abundance of storage space is a Kadey-Krogen signature feature. And the joinerwork is simply outstanding. There are four steps up to the pilothouse from the saloon level. The steps are equipped with night lighting, and the top of each opens to reveal storage inside. The Krogen 44 pilothouse definitely benefits from the increased length. It is 10 feet long from aft bulkhead to forward fixed windows, and 11 feet across. What this means is there is now room for a Stidd or other high-end helm chair without restricting movement around this command center. Headroom averages 6 feet 5 inches. A raised settee doubles as a watch berth and should prove a great place to assist the skipper when exploring new cruising grounds. The settee is a tad too tall on this first boat and will be lowered a few inches on the next boat. But it is one of the very few tweaks Kadey-Krogen has identified for future boats. A lot of time went into this new design for just this reason. A full-size chart table with chart drawers is left of the recessed center helm console, and a matching surface with a deeper drawer is on the starboard side. The view from the inside helm is outstanding forward and to each side. Two rectangular, 16-inchwide ports are on the aft bulkhead for a degree of visibility astern. The 26-inch teak wheel is another Kadey-Krogen tradition. None of the pilothouse windows open (so they don&apos;t leak, either), except the two aft ports, but the dogged Dutch pilothouse doors open out to the side decks. If you like the look and feel of a Kadey- Krogen pilothouse, you&apos;ll love the one on the Krogen 44. It inspires confidence. Four steps down from the saloon bring us to a layout that&apos;s perfect for a couple. Immediately on the port side is a full head with separate shower (with seat), a freshwater Vacuflush toilet, two opening ports and an aft-facing vanity with sink and mirror. The liberal use of light-colored laminates, overhead lighting, and teak or cherry trim creates a bright, clean-feeling head. The Corian vanity counter matches the Corian counter in the galley. Across from the large head is what Kurt calls the den, a space evolved over the years to serve as the ship&apos;s office, reading room, and occasional guest cabin. An L-shaped settee pulls out to become a double berth, and a swingdown Pullman berth over the desk transforms the office into a grandchildren&apos;s fantasy nook and bunk room. Given the fact that most Krogen owners are retired couples who aren&apos;t looking for regular and frequent company, this den concept has much to recommend it. I think it is a more effective use of space than a second dedicated stateroom. In fact, I&apos;d nix the berth over the desk and add more shelves for books, printer, and cruising guides. The den does have large, fiddled shelves and drawers and lockers, however, and there is also an engine-room access door, complete with inspection port and outside light switch. Moving forward to the bow area along the 25-inch-wide companionway, I found a stacked Asko washer and dryer just forward of the guest head on the port side. From there, steps lead up into the master stateroom. When Kadey-Krogen eventually offered an island queen berth in the master stateroom on the Krogen 42, instead of a head in the bow and a custom bed fitted against the starboard side of the hull, the company and its customers never went back. So it was no real debate on the layout of the master in the new 44. The island queen is central in the stateroom; the headboard is a solid bulkhead (the collision bulkhead, in fact). Under the mattress is a cavern of storage, plus six deep drawers for clothing. This stateroom offers his and her hanging lockers, four 14-inch opening ports and a large overhead hatch, all of which help make the cabin bright and inviting. And the woodwork is lovely: Kurt told me the yard uses solid teak for all doors, and the only veneer is on bulkheads, which are carefully matched to look continuous. Several sole hatches open into separate bilges for access to the 228-gallon stainless-steel water tank, Sealand waste pump, and air conditioning equipment. It is all very well thought out. It is just the thing for folks living aboard for extended periods. From any access point into the engine room, I found 45 inches of headroom in the engine space under the saloon. Giving the boat the standing headroom enjoyed on the Krogen 39 would have required raising the profile of the boat, something Kurt was loath to do. But as I spent time sitting in the space, the lack of clutter makes moving around less of a chore than it might seem at first. The single John Deere 6068TFM is in the middle of the engine room, with 30 inches of passable space between the engine and the two aluminum 5052- alloy fuel tanks (with sight gauges) that are located outboard of the engine. The diesel is mated to a Twin Disc MG5061 3:1 reduction gear, attached to a 2-inch Aquamet propeller shaft that runs through a dripless Tides shaft seal to turn the four-blade, 28-inch-by-18-inch nibral propeller. Extensive sound-deadening insulation (from Soundown) is used in the engine room to reduce sound transmission into the living areas, and a Centex muffler is standard. Dual switchable Racor 75-900FG fuel filter/water separators with a vacuum gauge are located just inside the access door in the den. A smaller Racor 500FG filter for the Northern lights genset is mounted on the port fuel tank. And now I must digress for a moment. Using the Racor FG series filters-for whatever reason-is just plain wrong. Even though I see them on most boats built in Taiwan, China, the United States, and Canada, it is the wrong filter, and there simply is no reason to use it. The FG series filters are designed for the on- and off-highway markets and lack several important features that come standard on Racor&apos;s MA (Marine Application) Turbine series filters. A Racor 900MA unit is different in several respects. It has a stainless-steel heat deflector shield around a clear bowl with a metal drain fitting, unlike the plastic drain on the FG. The bowl of the FG series is amber to provide some level of UV protection, which makes it much harder to see contaminates. Although UV protection may be a useful feature on a truck or a farm tractor, it adds nothing in the engine room of a trawler yacht. I just don&apos;t get why builders do this, as the difference in cost is minimal. In any case, if a vessel so equipped were inspected by the Coast Guard for commercial operation, it would fail. The FG series is not approved for marine applications. Simply retrofitting a heat deflector shield on an FG filter does not meet Coast Guard approval either, according to PMM&apos;s technical editor, Steve D&apos;Antonio. Another common practice is the use of copper fuel lines. Copper lines have several disadvantages, which we&apos;ve discussed before, so I&apos;m happy to report that Larry Polster told me the company is indeed working on upgrading the fuel system to use Trident fire-rated fuel hose in the future. Improvements in technology, when properly applied in boatbuilding, increase the vessel&apos;s safety factor. Fire-rated fuel hose is a perfect example of a change whose time has come. A 160-amp Balmar alternator, which can be used to charge the boat&apos;s four house batteries (Lifeline AGM GPL-8L rated at 255Ah each), is mounted on the Deere engine. The main starting battery is another AGM GPL-8L. A Heart Interface charger/inverter manages the system. One more thing I&apos;ll just mention: The master battery switches are mounted in the engine room above each bank, a definite safety no-no, and yet another common building practice. In the event of an engine-room fire, it is critical to turn these switches off, yet it is often deadly to go into a burning engine room filled with toxic fumes to do so. But again, Larry Polster told me that Tom Button, Kadey-Krogen&apos;s VP of operations, is already working on a more suitable location for these switches, out of the engine room. This brings up another important ingredient of this story: Every minor comment I had during my time on the boat was duly noted and discussed with a great deal of enthusiasm. Kurt, Larry, and Tom are not kidding about pursuing a higher-quality boat, and each appreciated honest observations. It is most impressive-and not all that common, in my experience. There is a freshwater washdown just behind the Northern Lights genset, which can be matched to specific owner requirements: 6kW, 8kW, 10kW, and 12kW cover the bases of electrical needs. All major systems and maintenance points on the Krogen 44 engine room are out in the open, not hidden behind panels. And reaching down under stringer and limber holes, I found no ugly seams of ragged fiberglass, but rather, sanded, resin-sealed edges. Nearly 100 percent of today&apos;s Krogens come equipped with stabilizers, not so much for stability as for reducing the discomfort of rolling at sea. Although some serious passages, including a transatlantic trip, have been made on these boats without active stabilizers, this lifestyle is all about comfort. I had the opportunity go out in some sloppy offshore weather with Larry on Number One and see firsthand how the boat handles and what it feels like to move about the 44-footer under way. At her cruising speed of 8.5 knots, the Deere set at 1850 rpm, I measured 70dBA in the saloon (cockpit door closed), 66dBA in the pilothouse, 67dBA in the master stateroom (with the door closed) and 99dBA in the engine room. These measurements were taken with air conditioning and genset off. Walking the side decks, and even at the bow, I found the handholds and railings just at the right places and and at the right height. Leaving St. Lucie Inlet, we entered the confused seas of the offshore coast. The stabilizers kept the boat under control, and we simply handled the seas with ease. Kadey-Krogen knows something about building a good seaboat, even if most Krogen owners prefer quieter waters. The new Krogen 44 is the latest to join the Kadey-Krogen fleet of full-displacement cruising boats, which have proved to be comfortable liveaboard trawlers for a full generation of trawler owners. With a higher level of quality now serving as the benchmark of the company, I bet we&apos;ll continue to see ongoing improvements that make a good boat even better. I think it is a happy, comfortable, well-built boat. It does not try to be everything to everyone, but it&apos;s perfect for those who fit its character. While my current life remains a journey at higher-thandisplacement speeds, at some point I&apos;ll have the luxury to slow down. And that is precisely where, in life&apos;s journey, Kadey-Krogen comes in. 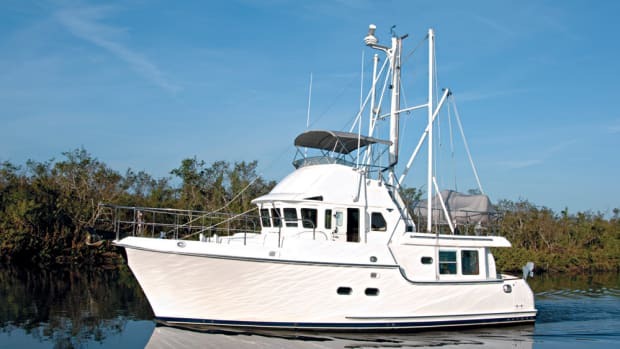 While this new trawler is a refinement of a classic, in every way it is a hugely improved modern interpretation of the late Jim Krogen&apos;s own Krogen 42, Huckleberry. His son Kurt is the driving force behind this latest creation, and I imagined a certain destiny unfolding when I learned Kurt has reserved a slot in the building schedule for a 44 of his own. That says it all; the circle will soon be complete. Congratulations, Kadey-Krogen Yachts. You hit the mark. And I hope to one day anchor in those same clear waters not far off your stern, Kurt, when my time has come-to wiggle my toes in the warm sands of paradise.